Ramps on the Moon consortium member Graeae Theatre Company have already had a busy start to 2017! Their most recent revival of a Lorca classic has opened at the Royal Exchange in Manchester, and their ground-breaking musical Reasons to be Cheerful has been funded to tour the UK this autumn. Jenny Sealey and Kathryn Hunter redefine Lorca’s final masterpiece with the Royal Exchange. 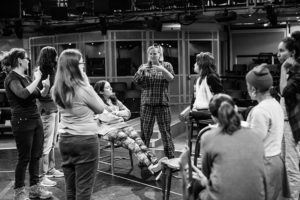 A bold exploration of female identity, sexuality and power: Lorca’s The House of Bernarda Alba is beautifully transformed for the Royal Exchange’s distinctive in-the-round theatre in a co-production with the trail-blazing Graeae Theatre Company. The House of Bernarda Alba is directed by Graeae’s Artistic Director Jenny Sealey, in a translation by Jo Clifford with the award-winning Kathryn Hunter in the title role. Deftly weaving the incredible talent of Deaf and disabled actors into this compelling drama, each performance creatively integrates British Sign Language, Audio Description and Captioning. The production is running from now until 25 February 2017. Critically acclaimed musical Reasons to be Cheerful will receive £220,000 as part of Art Council England’s Strategic Touring Programme, to tour to seven regions across England in autumn 2017.